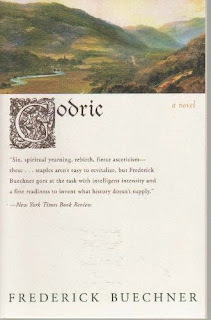 Novel, biography and spiritual meditations – Frederick Buechner’s Godric is all of these at once. Nominated for a Pulitzer Prize, Buechner tells the account – using as many real facts as are available – of Saint Godric of Finchale, a 12th century holy man who lived the second half of his 105 year-old life as a hermit in the woods, praying and befriending animals. Godric is also recognized as being author to the oldest recorded verse in the English language. Buechner tells his story as if it were the (also real) account being laid out for a contemporary of Godric, Reginald – a local monk who asks Godric’s permission to record his life. Buechner stays faithful to the language and sentence structure of the day, making his 175 pages not as quick a read as you might think. In addition are the many passages that felt I needed to re-read in order to grasp their weight. Godric is not a man without struggles, and even well into his hermit years, he grieves over the sins he can’t seem to tame. A friend of all animals, Godric befriends two snakes who are frequent invited guests in his cave. (Two of five living beings Godric calls ‘friends’ from the beginning of his story.) When Godric finally sends them on his way, he laments that he is not able to tame his sin nature the way he has tamed the serpents. For me, one of the most moving passages was when Godric reflects on an experience during one of his pilgrimages. Near Jerusalem, Godric baptizes himself in the Jordan river: “Nothing I ever knew before and nothing I have ever come to know from then till now can match the holy mirth and madness of that time. Many’s the sin I’ve clipped to since. Many’s the dark and savage night of doubt. Many’s the prayer I haven’t prayed, the friend I’ve hurt, the kindness left undone. But this I know. The Godric that waded out of Jordan soaked and dripping wet that day was not the Godric that went wading in. As a Christian, I think one of our common struggles is recognizing moments of holiness, moments where God stepped in and created a milestone for us; and yet, as humans do, we can’t live up to what we know God requires of us. It is the same struggle Paul grieves over in Romans when he says he does what he doesn’t want to do, and does not do the good he wants to do. Anyway, there were many times that I related to the human experience that Buechner lays out in Godric’s life – not only about his spirituality but about friends, family, travel – life. Godric has been on my TBR pile for almost ten years – since a friend gave me Listening to Your Life – a book of daily meditations that are all excerpts of Buechner’s writings. Buechner, a Presbyterian minister, definitely has a gift, for crafting a well-turned phrase, and at the same time conveying truth in it. He’s a must-read for anyone – Christian or non alike. I would probably not have picked up this book on my own but reading your review, along with the excerpts from the book, make me want to check this one out. I love the beautiful way the thoughts are worded, like "Many's the dark and savage night of doubt." Just poetic really. Thanks for the review! Rebecca – Poetic is the perfect word for Buechner. Do pick him up!